“The Green Bird, Chateau Mirambeau,” Lindsay Goodwin. 8″ x 10,” Oil on Canvas. At the crossing of the Cognac and Bordeaux vineyards lies a 16th-century stone-built mansion that rivals Cinderella’s. Château de Mirambeau is a cultural playground as well as a natural retreat overlooking the Gironde estuary. It may come at no big surprise then that artist Lindsay Goodwin found her way to this treasured oasis, for its rooms are decadent enough to entertain Marie Antoinette. Every table, every wall boasts plush decor. One person even wrote in their review that the hotel “made them feel like they were living in a movie.” See for yourself: Château de Mirambeau. 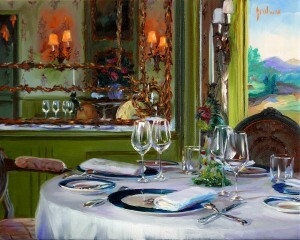 In Lindsay’s painting “The Green Bird, Château Mirambeau,” she has portrayed a scene from the elegant dining room at the hotel. In fact, there is not just one green bird, but many decorating the candlesticks around the room. The gilded mirror in her painting is really extraordinary: notice the detailed reflection of the table settings and wallpaper. 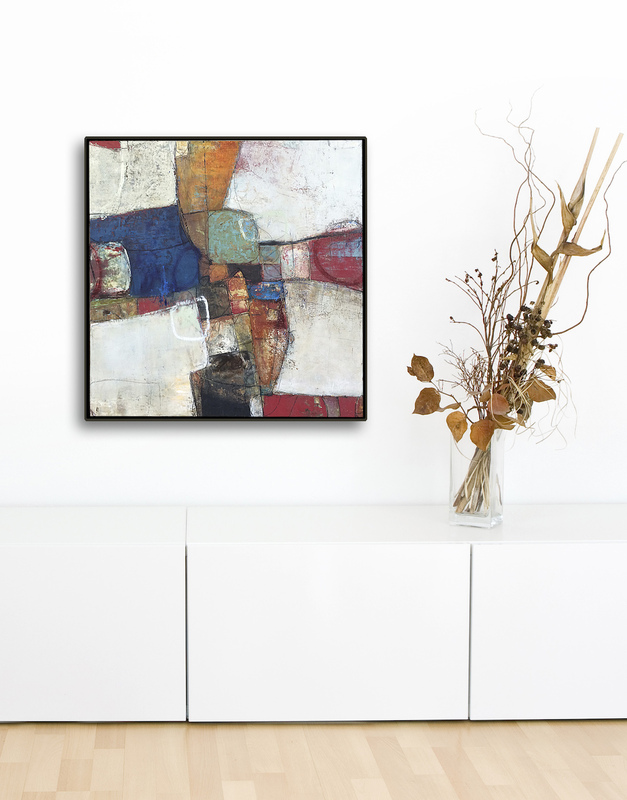 Also unique is the perspective of the viewer, which spans both the interior of the room as well as out a door or window on the right. Lindsay demonstrates both the grandeur of human achievement as well as natural beauty of the landscape, summing up the hotel in one perfect moment. It has been a while since I’ve posted, but I am pleased to say that “Work of the Week” is back and a double at that! 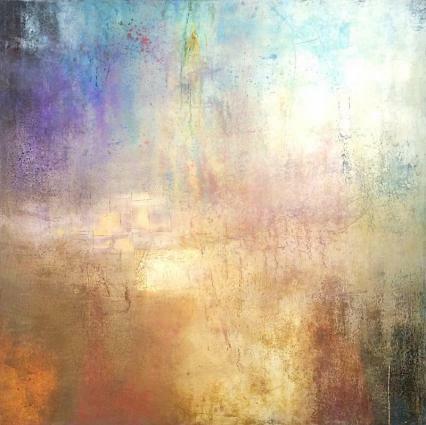 In the next few weeks, we will be exploring some of the stunning new pieces by Lindsay Goodwin to celebrate her newest exhibition. Up first: two lovely scenes at Crillon Le Brave in Provence. Below, you will see both an interior from the Restaurant Jerome Blanchet at Hôtel Crillon le Brave as well as a landscape of the medieval village. 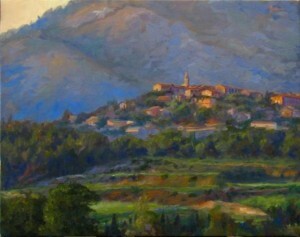 A refuge set among the vineyards near Avignon, the hilltop town dates back to the 14th century and Roman rule. It now boasts charming markets, walking trails, breathtaking views, and of course, all the wine tastings you could desire. Imagine strolling through the vineyards, popping a grape into your mouth here and there under the warm sun. After a long and invigorating day, you retire to your hotel and tuck into a cozy meal at the hotel’s luxurious dining room. You might order the roast lamb, purple potato gnocchi or foie-gras flavored with cherries. Whichever you choose, don’t forget your French! But truly, the proof is in the pudding: Lindsay has once again immortalized the moment in the most elegant fashion and Crillon le Brave has never looked more beautiful. Merry Christmas Everyone! While we have a sunny paradise to call home, now is one of the rare times when I wish it would snow…. to have fresh powder sparkling as it falls from the sky and a crunchy white blanket beneath my feet during this holiday season. Fortunately, here at the gallery I have had plenty of substance from which to dream about in the form of Aleksander’s Titovets wintry landscapes. Aleksander’s snow scenes are more than unbelievable– they’re magical. 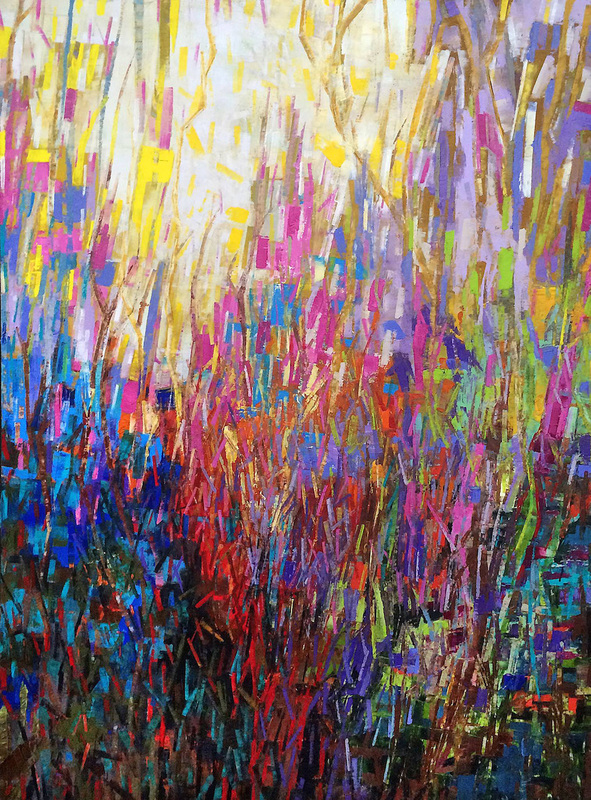 With shades of pink, blue, light purple, and small splotches of white, Aleksander renders ground that from a distance looks like shadows on freshly fallen snow. 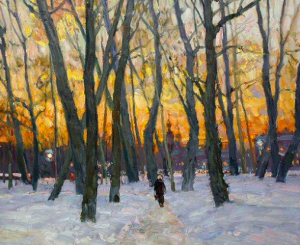 One of my favorite pieces from his and Lyuba’s new show, “Paris to St. Petersburg” is “Sunny Winter,” a stunning 40” x 30” that depicts just a few bare trees rising out of a snow covered ground. 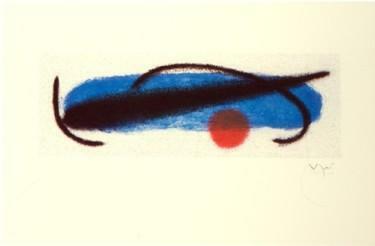 I like this piece for its simplicity and perspective. It is almost as if we are skiing down the hill that Aleksander has created. 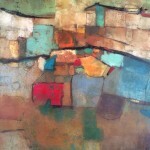 The shadows are heavily concentrated in the foreground, with a resulting palette of cool colors. 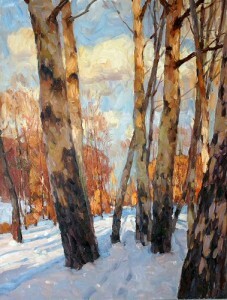 However, the impressionistic and bright leaves on the trees in the background create some warmth that is eye-catching. This time of year, what could be better than a sunny winter snow day? 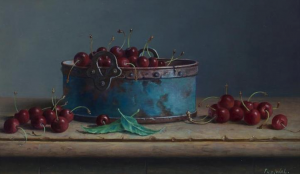 Oil Painter Lindsay Goodwin is known for her decadent interior scenes of lavish restaurants in Paris, but once in a while she goes for something a little different. In between dinners at chateaus and desserts at Laduree, she occasionally finds time to steal out to Provence for an intimate gathering of family or friends (also where Lindsay and her husband tied the knot!). The glasses are still sparkling and the napkins white, but two baguettes on a cutting board suggest that the affair is slightly more laid-back. 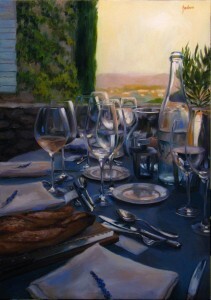 Black-tie or not, “Table View of the Sunset over Provence” has that infamous je ne sais quoi that we can’t resist! 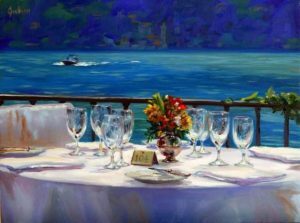 The clarity of light and reflection in the glasses and silverware, the colors that shimmer on the napkins, and the perspective that makes us want to scooch in our chair at the table have us longing to be inside this fabulous work of art. 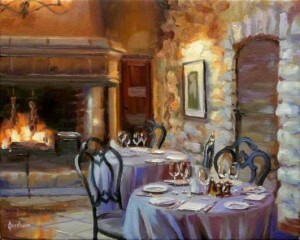 Goodwin has created a perfect moment of beauty before the sun sets and the plates are filled and subsequently emptied. She invites viewers into this work over and over – from the sprig of lavender that is local to southern France, to the juxtaposition of the cool table with the warmth of the sun that makes this an approachable and well conceived table. 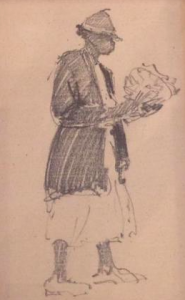 Viewers love Goodwin’s works for their execution, but also for the invitation they present. Where (besides this painting!) can you find a good baguette in Charleston? Try some of our favorite local bakeries listed below! We are so excited for our upcoming show, “Paris to St. Petersburg,” featuring Aleksander and Lyuba Titovets- we can’t stand it! The show encompasses nearly twenty fresh paintings from the famed Russian couple who now reside in El Paso, Texas. The majority of the new works feature their travels throughout Europe—highlighting the cities of St. Petersburg and Paris, but paying homage to smaller towns and the countryside as well. 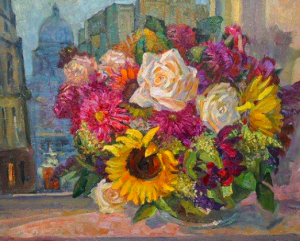 I plucked out these two beauties because I felt they captured the essence of the show—luminous, lush, and breathtaking scenes of city and nature. Aleksander includes all of the seasons in “Paris to St. Petersburg,” but winter is definitely a highlight. 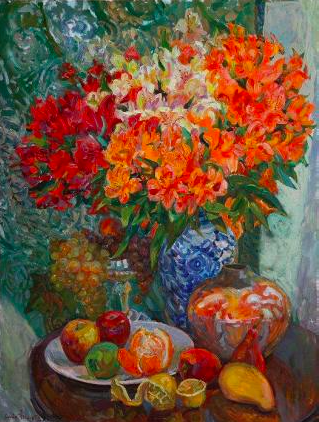 As for Lyuba, her still life flowers are for any time of year; warming my heart even though winter has clearly descended upon us in Charleston. While they were trained separately, the Titovets’ works have a shared style. In both “Evening in the City,” and “Paris Opera,” we see Impressionism in full-force, not to mention a very similar color palette. Aleksander is definitely more inspired by the light and shadow in his work, which depicts dusk in a city that is possibly St. Petersburg. 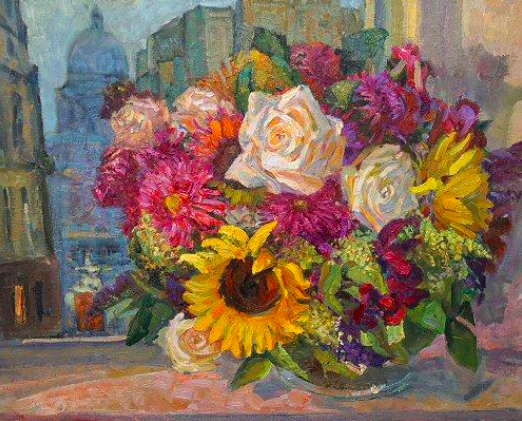 Lyuba focuses on the detail of petals and scale, adding intrigue by placing her subject off-center so that we are able to view the outline of the Paris Opera House in the distance. 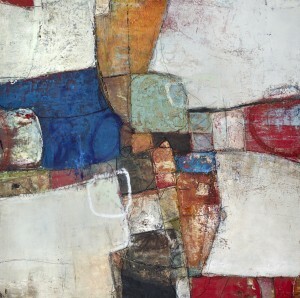 To view more images from the show, please visit http://www.ellarichardson.com/artists.php. Opening coincides with the French Quarter Art Walk on Friday, December 5 from 5-8pm. 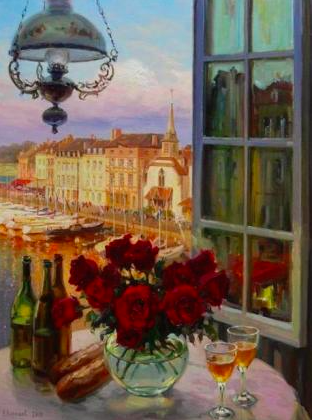 Over a glass of bubbly cider (the beverage of the province) and a vase brimming with luscious roses, you look out across a picturesque port and sigh…. A row of houses with slate-covered facades borders a sparkling harbor. Sailboats effortlessly glide by as the Clocher Sainte-Catherine tolls the hour. 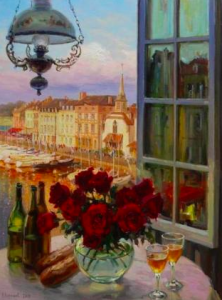 It is a perfect day in Honfleur, France…the kind of day you wish to capture in a painting. The beautiful Honfleur has always struck favor with artists, especially the Impressionists. No less than Monet, Courbet, Cals, Dubourg, Boudin, Bazille, Corot, Sisley and Jongkind have immortalized the subject in their works, providing an array of perspectives and a shared love of aestheticism. 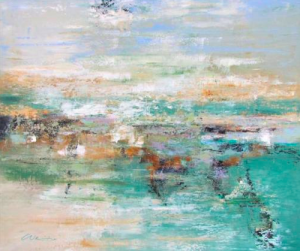 French landscape painter, Eugene Boudin described La Ferme Saint Simeon hotel in Honfleur as “the most ravishing spot in the world.” Fortunately, the scene has hardly changed over the years, prompting contemporary artists to seek out Honfleur’s old world beauty. Born in Moscow, Evgeny and Lydia Baranov met when they were both working as architects with the Institute of Special Projects in Restoration. 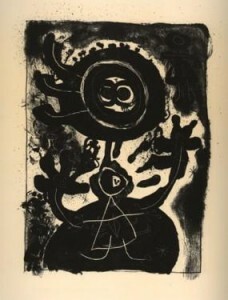 They married and eventually began painting together—a highly unique method of simultaneous collaboration that provides variability and depth to their works. 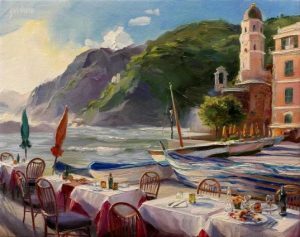 Most of their paintings are characterized by a realistic and sometimes semi-Impressionist style infused with drama and sensation. 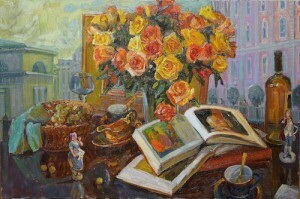 It is hard to look at one of their works and not feel moved –“Roses and Cider” being no exception. The couple has been featured in numerous exhibitions nationwide and their works are housed in the collections of the Hearst family, the Clint Eastwood family, the Alaska Court System, the Royal Family of the United Kingdom, and others. They currently reside in Pebble Beach, California. Notes: Some information on Honfleur gathered from www.dailymail.co.uk. Access article here. 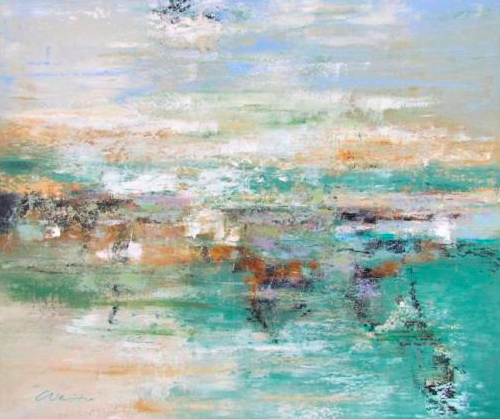 What could be more serene than this abstract seascape by Karen Weihs? 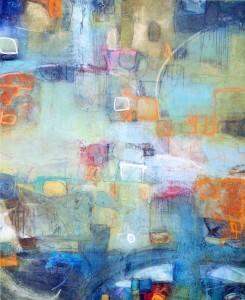 She has a true gift for infusing a mood into a canvas, which she does solely armed with a palette knife. “Seascape” is the perfect mélange of colorific swipes and textural contrasts with electrifying results. 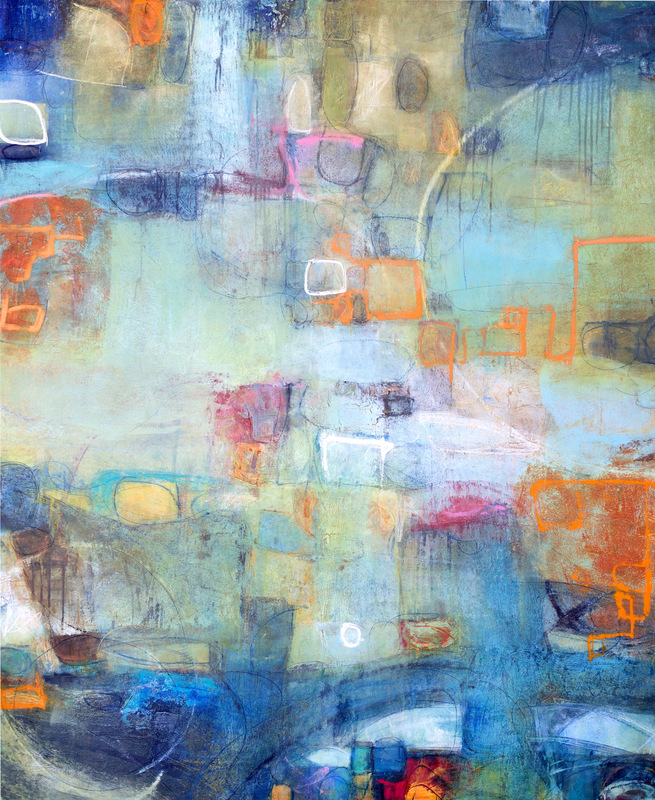 This particular work echoes the natural palette of the Lowcountry, while representing Karen’s quintessential expressionist style. Weihs is a native of Charleston who currently resides in Cashiers, NC. 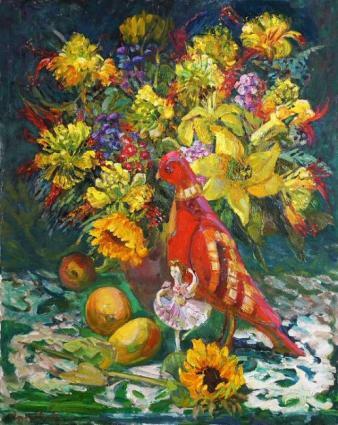 She received her BFA from the University of Georgia and gives credit to the influence of Professor Lamar Dodd and mentor, Frank Licciardi for first inspiring her painting style. 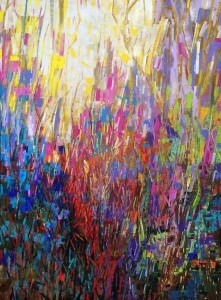 Weihs began her professional career as a graphic designer, but sensed her true calling and moved onto oils shortly thereafter. In 1994, she received the Artist of America Award and her works are housed in the collections of The Biltmore Estate and the Mansion of Turtle Creek Restaurant. “Karibu II,” by Marianne Houtkamp is an 18.5” bronze sculpture of an African woman swaying to an invisible drumbeat. Her posture, her gestures, and her countenance imply that this tall, strong figure is lost within herself—born again into a musical trance that is at once cultural and individual. Internationally acclaimed sculptor, Houtkamp attests to trying to capture the details of tribal people as they are, so we can assume that not only is this woman from Africa, she is perhaps representative of a specific woman and at the very least, of a particular tribe—the Samburu. Karibu means “Welcome” in Swahili. Yet, it is not her accomplishments that keep her going. 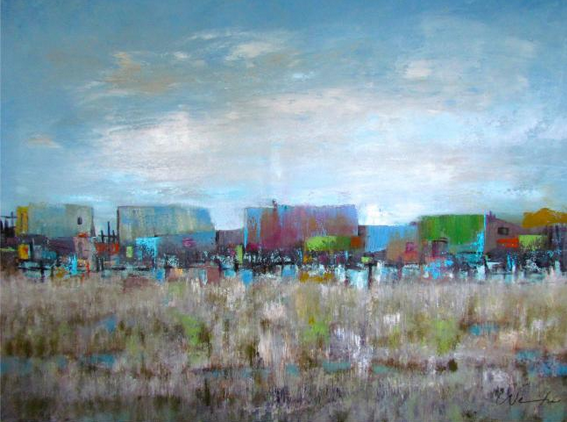 Houtkamp lives for travel and people and her work is a testament to this combination. In addition to Africa, she has represented South America, Europe, and the Middle East. 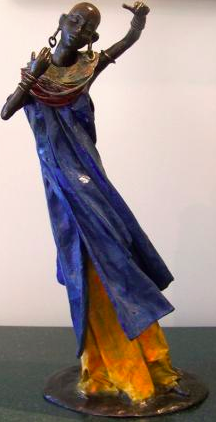 “Karibu II” is the perfect conglomeration of Houtkamp’s sculpting skill, cultural awareness, and color utilization—the piercing royal blue of the figure’s garb comes from Houtkamp’s patented color process, in which the bronze undergoes an acidic transformation to form brilliant patinas. 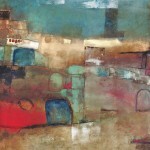 For more of Houtkamp’s work, visit this page. Houtkamp, Marianne, Astrid Van. Galen, W. Fibbe, Erik Van. Aken, John Ruijs, and Hans Houtkamp. Bronzes. Laren: Uitgeverij Van Wijland, 2013. Print.